Jaime Lerner is the father of Curitiba’s bus rapid transit (BRT) system and believes car culture will soon be a thing of the past. Photo by Thomas Locke Hobbs. According to Jaime Lerner, car exhaust is the new second-hand smoke. The visionary architect, urban planner, and former mayor of Curitiba has long been outspoken about the growing social stigma around private vehicle usage. In fact, Lerner predicts that the private car will soon become a societal nuisance on par with smoking in public: “You can use it”, he says, “but people will be annoyed by you”. In a speech at last week’s III Congress: SIBRT Best Practices in Latin America, Lerner doubled down on this claim, stating that “there is no future for cities if they depend only on cars”. Despite Lerner’s certainty, private vehicle ownership in Brazil has steadily increased in past years. According to the World Bank, there are currently 209 private vehicles per 1,000 people in Brazil, up from 164 ten years ago. Over the same period, demand for public transport has fallen 33% from 60 million passengers per day to 40 million. So what makes Lerner so confident that private vehicles will soon be shunned in favor of public transport? According to him, he’s got three main allies in the fight against car culture: increased congestion, environmental awareness, and high quality public transport. Imagine standing in a 50 square meter room with one person smoking a cigarette. Now imagine standing in that same room with 50 people all crammed in tight together, all smoking cigarettes, and you can’t leave. For Lerner, that might as well be the experience of being stuck in traffic: jammed in with no escape, forced to steadily breathe in exhaust fumes. But he predicts that the public backlash against increasing traffic is not far off. 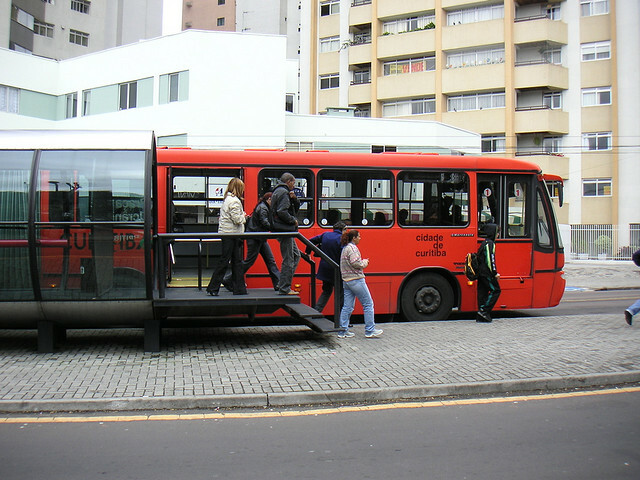 Though car ownership rates in Curitiba are higher than the national average, the Transportation Research Board reports that 70% of commuters there use public transport as their primary mode of transportation. The next step, says Lerner, is that these commuters won’t even buy cars in the first place. If Brazil and other cities can deliver on Lerner’s idealized view that transport users “shouldn’t have to wait more than a minute” to catch their bus or train, this shift may be happening sooner rather than later. Coupled with the everyday response to frustrating traffic and congestion is a growing sense of individual environmental responsibility. Lerner posits that there are three main issues facing cities and citizens as they interact in the world: “mobility, sustainability, and tolerance”. In order to confront these challenges, it is “crucial to have solidarity”, he says. Brazil’s environmental movement, which Lerner is credited with catalyzing, is responsible for making citizens more aware of the negative impacts of private vehicle use – poor air quality, greenhouse gas emissions, the decline of public space, and overconsumption of natural resources to name a few. According to Lerner, as long as the movement maintains solidarity, this awareness will soon translate into a shift away from private vehicle use. Perhaps the most crucial element of Lerner’s strategy to dismantle car culture is his goal to significantly increase the quality and responsiveness of public transport systems. Lerner conceives of a world in which transport and urbanism are inherently integrated – where transport systems are the backbone of sustainable, accessible cities. For that to happen, public transport can’t just be an option, it has to be the best option. That’s why Lerner currently serves as the honorary president of SIBRT – the association of Latin American Integrated Transport Systems and BRT – an organization dedicated to promoting best practices in bus rapid transit (BRT) and integrated transport systems, which Lerner pioneered. A quality user experience, say Lerner and SIBRT, is the key needed to coax society out of the car and into the metros, buses, and bike lanes of today’s sustainable cities. Thank you to Anais Cisneros, Ryan Schleeter (EMBARQ) and Fagner Glinski (SIBRT) for their contributions to this post.